Innovative wooden educational language learning toy for 3 year old, 4 year old and 5 year old children. 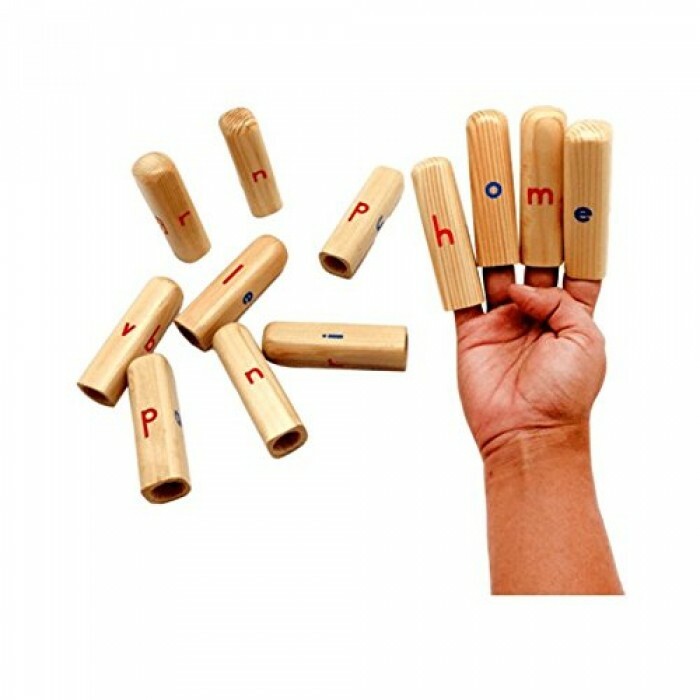 Set includes 12 wooden finger puppets with vowels and consonants printed on 4 sides Merging puppetry with the alphabet is a simple yet thrilling way to read, form words and keep children interested. They begin experimenting by 'wearing' different finger puppets to see what words can be formed. That's what gives this toy a universal appeal. Parents and children can both play various games by simply slipping on these finger puppets! Playing with this toy improves children's memory of word association and overall reading and pre-writing skills. This toy stimulates children's physical actions and helps them hone fine motor skills of their small but delicate fingers. Most importantly it encourages social activity where the child engages with a friend or a parent while playing. Polished beautifully with non-toxic paints complaint with EN-71 Part-3 guidelines Comes packed in a Skola Doodle box with a detailed instruction manual to use the toy effectively. The manual describes several interesting activities and games for the little Skolar that will challenge them incrementally at every stage.